Home » The Whole Damn Thing » Pop Culture » Comics » ‘Totally Awesome’ New Comic Book Day Giveaway! It’s Wednesday! Not that comic geeks need a holy day; but if we were going to have one, this would be it. New issues hit the shelves like a four-color tsunami. Series are launched, questions are answered, loyalties are tested, lives hang in the balance! And occasionally, if you’ve been a particularly good comic geek, you’ll get Hulk punching a giant, two-headed, fire-breathing turtle. Totally Awesome Hulk is the latest iteration of the green giant and, for once, it’s not Banner wearing the purple pants. Instead it’s Amadeus Cho – boy genius and all-around cocky teenager (or “pre-adult” as I tend to think of them). 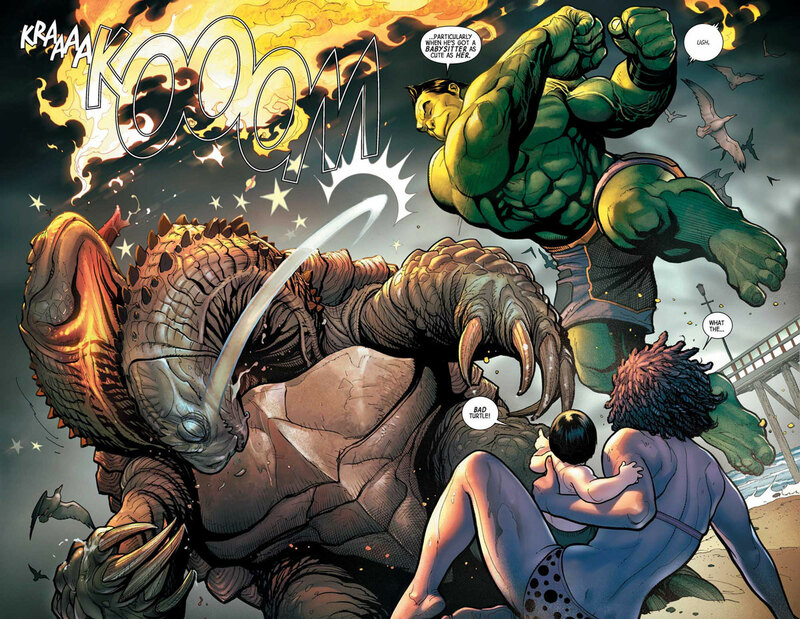 Writer Greg Pak is promising a Hulk that’s enjoying his immense power and actually in control of his faculties. Artist Frank Cho is backing it up with his always amazing (if not cheesecakey) art. If someone had no idea what comics were about, you could safely just hand them this issue and walk away, your work done. So now that I’ve talked it up, how about winning a copy for yourself? I’m going to do a New Comic Book Day Giveaway of four copies of Totally Awesome Hulk to the first four commenters on this post. Just let me know: If you could reboot any comic book character with someone completely new behind the mask, who would it be? A caveat, this will be a digital giveaway, so you’ll have to have a Comixology account to claim your prize.